The magical magnet set in Rainbow colors completes with total 200 pieces of mix-shapes and accessories, and 54 cards with stickers of letters, numbers, mathematical symbols, and animals. Rainbow colors build eye catching designs that appeal to boys and girls of all ages. High Quality ABS Plastic and environmental friendly materials are very safe for kids. Powerful magnet that instantly connect makes it easy to play. No worry of clean up after play, you can gather them easily because they’re magnetic, and then store them into the complimentary storage box. Kids can have fun by building their own models such as train, football and sky wheel. Meanwhile it arouses an interest in science, engineering and design. Magnetic set helps activate brain creativity and develop brain development. It is a fun educational magnetic toys that will benefit child who uses it. ★Total 254 pieces. 63 squares, 65 triangles, 8 rhombus, 8 semicircle, 8 sectors, 2 trapezoids, 2 pentagons, 2 hexagons 2 annular-sectors, other accessories and 54 inserts with stickers. An idea booklet included for your easy reference to build various kinds of models. ★Easy to clean. Can be washed by water and mild soap due to its plastic materials. ★Portable Storage box. This set comes with an easy-carrying plastic box which stores all the pieces. Perfect for use at home, in Schools and day care centers. ★Safe and durable. It made by high quality environmental friendly plastic and meets American Toy Safety Standards. ★Play and fun. Fits for all age kids, a best way for them to explore the world of geometry and architecture. Kids can follow the idea booklet or create their own design which inspires their imagination ability and creativity and have fun!! The Fridge Phonics Magnetic Letter Set brings phonics skills to life with 26 singing, talking letters. Perfect for keeping little ones busy learning, the magnetic school bus and letter tiles stick to your fridge or any magnetic surface. Children can place each letter into the bus window and press it to hear Tad say the letter’s name and sound. Press it twice and Tad will say a word that begins with the letter and then use the word in a sentence. Children can also press the music note to move and sing along to three learning songs, including the “Alphabet Song” and “Wheels on the Bus.” Designed by LeapFrog experts for children ages 2 and older, Fridge Phonics reinforces alphabet knowledge, including letter names and sounds, which is an important first step in learning to read. Playing with the letter tiles, which are designed for easy manipulation by little hands, also helps strengthen fine motor and coordination skills. This “spy paper” looks like ordinary paper, but is unique in that it dissolves in just seconds when contacted with liquid, resulting in a useless, non-reconstructible mulch which is far more secure than the output of any standard shredder. You can write on this paper normally, but contact it with any liquid, even saliva, and it transforms into a secure mulch. It’s ideal for those confidential notes that may have to “disappear” quickly with little advance notice. 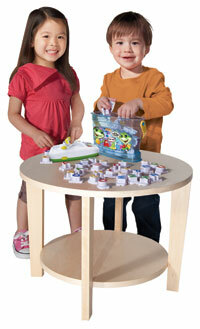 The LeapFrog Letter Factory Phonics teaches letter names and sounds in a fun, interactive way. Appropriate for children who are at least two years old, this learning toy lets little learners to place the 26 letter tiles of the alphabet in the factory to hear songs that teach the corresponding letter names and sounds. With its tactile play, amusing songs, and convenient portability, the Letter Factory Phonics provides an engaging way for your child to build early literacy skills at home or while traveling. Based on the award-winning Letter Factory DVDs (sold separately), the Letter Factory Phonics introduces children to the alphabet through the Alphabet Song and hands-on play. When children insert one of the 26 letter tiles into the battery-powered Letter Factory reader and press it into place, the unit plays a song about the letter and sound. Moving the letters into and out of the reader not only helps children learn their ABCs, but also helps develop fine motor skills. Kids can place letter tiles in the “factory” to hear songs. An additional button atop the unit allows children to hear the Alphabet Song, reinforcing what they’ve learned. For added convenience, a sliding switch allows the user to set the volume to the desired high, low, or off setting. The Letter Factory Phonics will automatically shut off after 15 seconds of inactivity to conserve battery power. The compact size of the Letter Factory Phonics makes it ideal for home use, at school, or on the road. The lightweight, detachable Letter Factory reader sits snugly atop a plastic pail that doubles as a storage unit for the 26 letter tiles. For easy transport, the pail has a bright yellow handle printed with the letters of the alphabet. Using the Letter Factory Phonics is a fun and simple way for children to learn the alphabet. Children as young as two years old should have no problem placing the letter tiles into the factory and pressing the button for play. While children will enjoy the playful songs and phonics, parents will appreciate the unit’s portable, storage-friendly design. 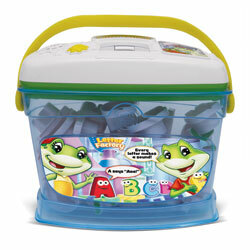 LeapFrog Letter Factory Phonics reader, storage pail, 26 letter tiles, three AAA batteries, and instructions.